While a cheetah cub had surgery to repair an abnormal growth in his legs, the cubs loyal puppy companion never left his side. 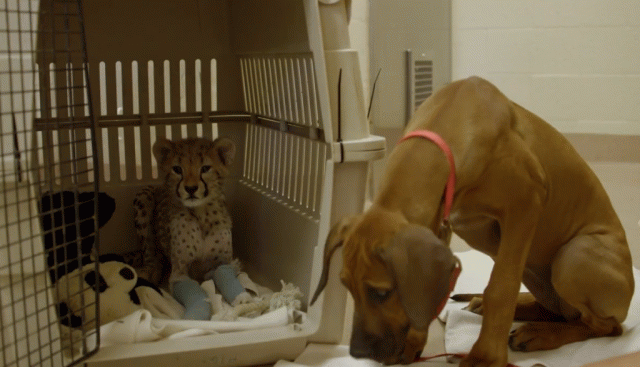 Raina, a female Rhodesian ridgeback puppy, traveled with her best friend Ruuxa, a male cheetah cub, while the cub had surgery at the San Diego Zoo Safari Park. The surgery was conducted to fix Ruuxa's bowed legs. Raina was constantly at the cubs side during the operation process, from traveling to the veterinarians office for surgery prep, to remaining close to the cub as he awoke from sedation. "This is a condition occasionally seen in domestic dogs and, if not treated, can cause pain and problems with the animals ability to walk later in life. With the help of Dr. Sean Aiken, who is experienced with this procedure, we were able to correct the deformity." As the surgery took place, Raina sat on the floor and remained in the operation room with Ruuxa. San Diego Zoo Safari Park officials said the two have been best friends since they were paired together at four and five weeks old. "Raina appeared very concerned about Ruuxa when she saw he was sleeping and she couldn't wake him. She licked him and nuzzled him, and when he awoke, she lay with him and seemed very content to know her cheetah was okay." Ruxxa is expected to make a full recovery after his surgery. Raina's concern for her best pal is amazing to watch. Check out the puppy in the video above.